Orthodontics is a specialist branch of dentistry concerned with the diagnosis and treatment of dental irregularities such as crooked, crowded, protruding teeth and poor jaw alignment. An attractive smile is a vital asset to personal self-confidence. The effects of straightening of crooked teeth on an individual's psychosocial well-being can be tremendous and orthodontics in childhood can make significant changes in increasing one's later quality of life. Research has even shown that having an attractive smile with well aligned teeth promotes positive impressions with regards to one's intelligence, social and career success. 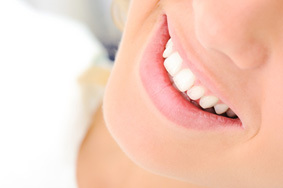 The aim of Orthodontics is to produce a healthy, functional bite, and improving personal appearance. Orthodontic treatment may also be carried out in partnership with your dentist to correct the position of teeth before provision of dental restorations such as implants or crowns and bridges. With the improved appearance of modern cosmetic braces, an increasing number of adults are choosing orthodontic treatment. Cosmetic appliances which are less conspicuous are available and include clear (tooth coloured) fixed appliances, "invisible" removable aligners, or completely "invisible" or "hidden" (lingual) appliances. Recent innovations have led to the development of self-ligating braces which have some advantages through their design, offering a lower friction treatment and thus often a more comfortable and hygienic treatment. 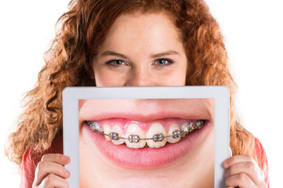 (These braces are available privately for both adults and children). Any dentist can call themselves an orthodontist, this simply means that they use braces on some of their patients. However, a specialist orthodontist is a qualified dentist who has completed three additional years of orthodontic training. They will usually have worked in a variety of hospital dental departments before applying for a postgraduate position. They need to have passed their specialist orthodontic examinations to have the letters MOrth RCS after their names. The orthodontists in The Orthodontic Clinic are specialist orthodontists and all have research degrees (e.g. MSc, MDentSci) in orthodontics as well. The General Dental Council (GDC) keeps a register of Specialist Orthodontists practicing in the United Kingdom. The GDC regulate dental professionals in the UK and set and maintain standards for the benefit of patients. Only dentists who are on a GDC specialist list may use the title 'Specialist'. Why Have I Been Referred To See An Orthodontist? Your dentist may have discussed with you the benefits of having healthy teeth and proper jaw alignment. Crooked and crowded teeth are hard to clean and maintain. This can result in tooth decay, worsen gum disease and lead to tooth loss. Other orthodontic problems can contribute to abnormal wear of tooth surfaces, inefficient chewing function, excessive stress on gum tissue and the bone that supports the teeth, or misalignment of the jaw joints. These can lead to chronic headaches and face or neck pain. Orthodontic treatment can be successful at any age, and adults especially appreciate the benefits of a beautiful smile. More and more adult patients are taking up orthodontic treatment in this day and age and there are many options to enable braces to be much more discreet than before. Treatment time typically ranges from one to three years, depending on the growth of the patient's mouth and face and the severity of the problem. Patients grow at different rates and will respond variously to orthodontic treatment, so the time to case completion may differ from the original estimate. Timings may also vary depending on the patient's compliance with treatment, particularly with wearing prescribed rubber bands, removable appliances or maintaining a sensible diet that does not cause numerous breakages to the brace. It is recommended that a child's first visit to see the orthodontist is around age 7 - 9, for a screening assessment to advise if orthodontic treatment is required and the best time for treatment. The first permanent molars and incisors have usually come in by that time and cross bites, crowding and other problems can be evaluated. When treatment is initiated at an early age, the orthodontist can guide the growth of the jaw and guide incoming permanent teeth. Early treatment can also regulate the width of the upper and lower dental arches, gain space for permanent teeth, avoid the need for permanent tooth extractions, reduce likelihood of impacted permanent teeth, correct thumb-sucking, and eliminate abnormal swallowing or speech problems. In many cases, early treatment as an interceptive measure will simplify treatment in later years.